The 4 days of volunteer activities at the Nassar Farm were busy and took on a regular rhythm, starting with early rising and breakfast, then our 9:00 morning gathering of 60-70 volunteers with songs, poems, prayers, and meditation on the daily themes: “Come and See,” “Come and Tell,” “Come and Act,” and “We Refuse to Be Enemies.” This was followed by mornings of farm work, then the workshops, discussions and optional activities before dinner. Campfire each evening, with some staying around the circle until after midnight. On the 4th and final day, we geared both the morning labor and our afternoon activities towards the big celebration event with invited guests, when the total audience exceeded 100. A stage and seating was set up in Solomon’s Theater, a beautiful spot surrounded by stone walls and right on the edge of the valley. One looked directly across to the large Jewish settlement to the east, and presumably, they looked back. 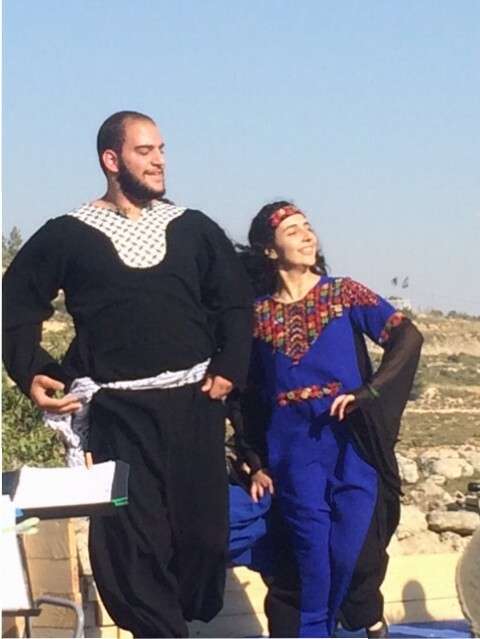 They certainly couldn’t help hearing the music and seeing the dabkeh dancers. It is a place where a wide range of nations, peoples, and musical traditions come together, for sure. For this joyful occasion, to celebrate 100 years since the Nassar Family purchased the land in 1915, there was no literal tent. It was under the sky and in the open air. The many members of 3 generations of the family that had gathered were brought up on stage several times to speak about their lives of hard work and much love on the farm, for family photos, and to be recognized and feted. We had 2 different troupes of dabkeh dancers, a professional one as well as 8 volunteers who learned a dance in only 4 days here, tutored by Jihan! You can see photos of both groups below.